According to folklore, when the bitterly divided world is in discord, King Arthur will return to save humanity. But the idea that the legendary King could appear in Brexit-era London comes as a shock to 12 year-old Alex Elliot (Louis Ashbourne Serkis). Mild-mannered Alex and his chubby best-friend Bedders (Dean Chauymoo) are constantly bullied at their middle-class suburban school by Lance (Tom Taylor) and Kaye (Rhianna Dorris). Fleeing from his tormentors, Alex sneaks into an abandoned construction site where he discovers a sword stuck in a piece of broken concrete. Extracting it, he reads the Latin inscription which indicates it might be King Arthur’s fabled Excalibur. Although he treasures the King Arthur book his estranged dad gave him, Alex doesn’t take it seriously until a fiery demon torments him that night. Then a bizarre transfer student named Mertin befriends him. It’s the wizard Merlin, of course. Switching between teenage form (Angus Imrie) and elderly (Patrick Stewart, wearing a Led Zeppelin T-shirt), he relates a centuries-old curse. Although Arthur’s evil half-sister, enchantress Morgana (Rebecca Ferguson), was imprisoned deep underground, during the upcoming solar eclipse, Morgana will rise to claim Excalibur. Enrolling his enemies as Knights of the Round Table and mentored in the chivalric code by Merlin, plucky Alex embarks on a mission that takes him through Stonehenge and beyond, pursued by flaming skeletons on horseback. 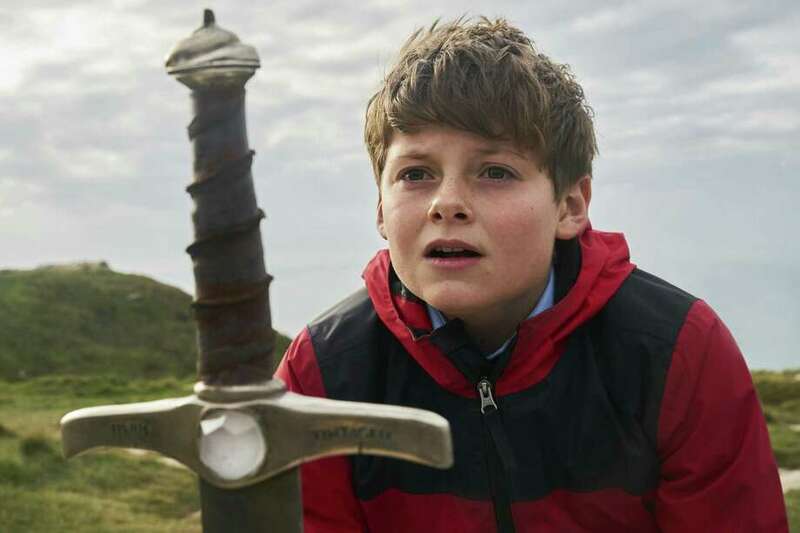 British writer/director Joe Cornish (”Attack the Block”) creates a witty, imaginative, updated Arthurian allegory, filled with wonder and delight. Conjuring Merlin notes that legends of the past are always filtered through “unreliable storytellers,” filling the needs of the powerful. “You must write them anew,” he urges. FYI: Louis Ashbourne Serkis’s father is Andy Serkis (”Lord of the Rings”). On the Granger Movie Gauge of 1 to 10, “The Kid Who Would Be King” is a sword ‘n’ sorcery 7, a charming fantasy/adventure for the whole family.